Jacuzzi Spa & Bath has been helping Leeds Rhinos and England rugby league star Ryan Hall touch down for a hot winning start to the new season with a J-375 model before two televised Super League fixtures. The Rhinos completed a run of pre-season friendly fixtures with an unbeaten record that has stretched into the start of the Super League season with a brace of wins on the bounce. They now have two fixtures under the spotlight of SKY coverage with a home clash against Huddersfield Giants at Headingley Carnegie on Thursday night before travelling to Hull FC a week later. Ahead of the Super League clashes, Ryan, pictured, was invited to the newly revamped Leeds headquarters of the Jacuzzi and Sundance Spas hot tub distributor in Low Road, Hunslet, to try out at brand new wet test facility, ahead of taking ownership of a J-300 Series model. Last year Ryan, who grew up in Leeds, signed a five-year deal with the Rhinos to build on his try scoring prowess that has flourished since he joined the Yorkshire club’s academy in 2006. This has seen him become England’s top try scorer in the 2014 Four Nations tournament as well as helping the Rhinos become the 2014 Tetley’s Challenge Cup winners. To assist him in choosing a Jacuzzi model to enhance his performances even further, Ryan was given a sneak preview of the redesigned Leeds showroom before touching down in the soothing comfort of one of the dedicated wet test models. He then opted for the delivery of a J-375, which is in the same revamped J-300 Series as the WhatSpa? Best Buy Award-winning six-seater J-355IP, for his own personal use. The six seater J-375, which comes in at 231 x 231 x 96cm and incorporates a lounger option within its seating configuration, has 34 PowerPro Jets and 12 PowerPro BX Jets that will now help Ryan maintain his peak performance and complement his rigorous training and playing schedules with advanced hydrotherapy that Jacuzzi is world famous for. 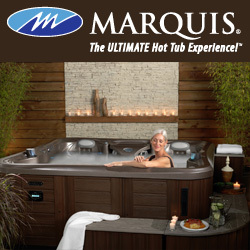 “Jacuzzi is the original hot tub brand and well known for its expertise in hydrotherapy spa systems,” enthused Ryan. Jacuzzi Spa & Bath Marketing Manager Paul Farrell highlighted that the iconic Jacuzzi brand has been boosting sales and marketing initiatives for hot tub retailers by building a strong relationship with athletes, including former World Triathlon Champion Helen Jenkins, who are advocating the benefits of hydrotherapy combined with their training and injury recovery regimes. “Top sports people like Ryan really appreciate the therapeutic benefits of our products and the role they can play in recovery and rehabilitation,” said Paul. Filed Under: News, News & views, Sales & marketing Tagged With: hot tub retailers, Jacuzzi, Jacuzzi Spa & Bath, Leeds Rhinos, Ryan Hall, Sundance Spas, WhatSpa?